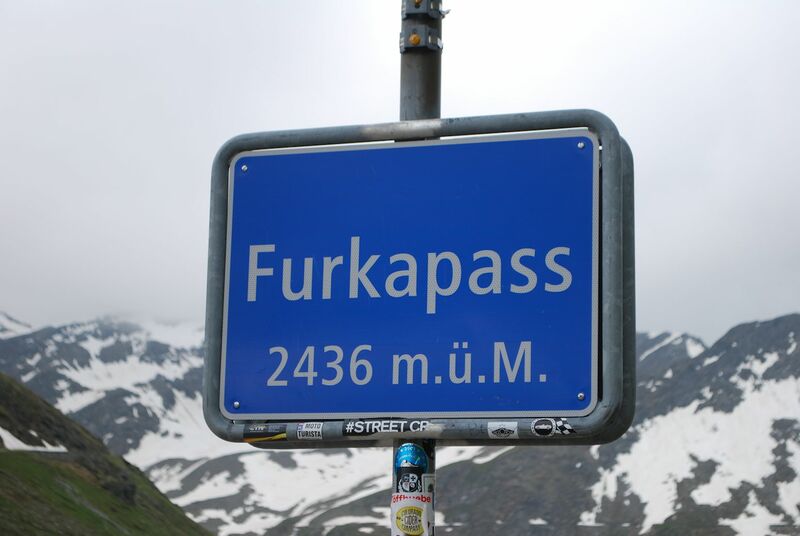 Das Loop #6: Furka Pass. 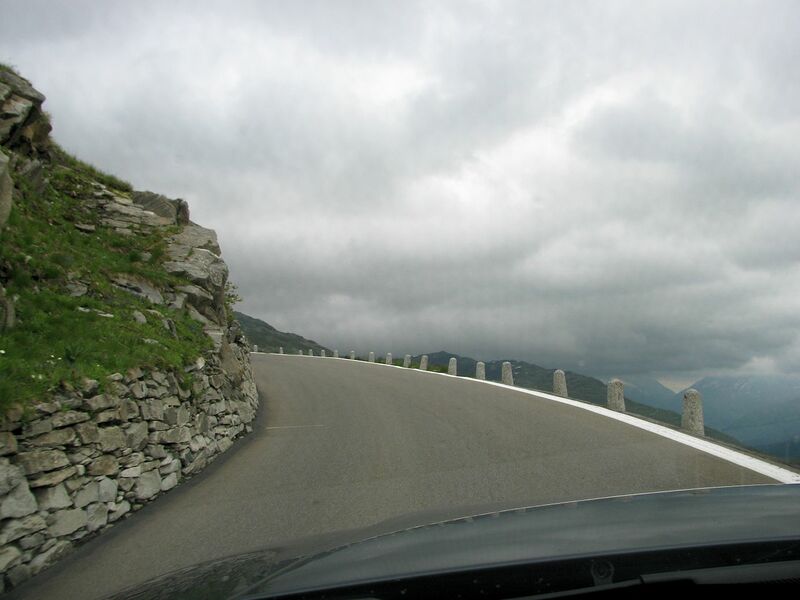 Nobody expects an easy ride on James Bond’s favourite mountain road, do they? For maps see below. Click photos to enlarge. 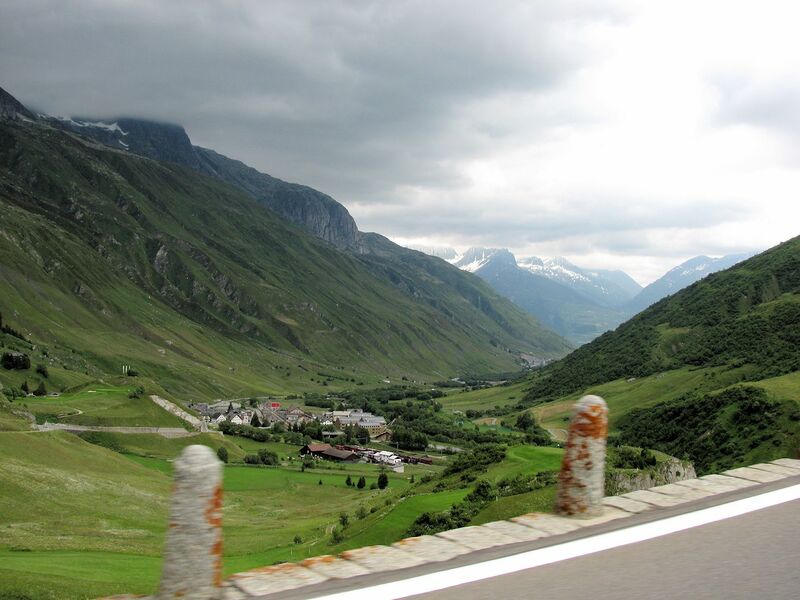 The east end of the Furka Pass starts from the Gotthard Pass at Hospental, just up the Urseren Valley from Andermatt. 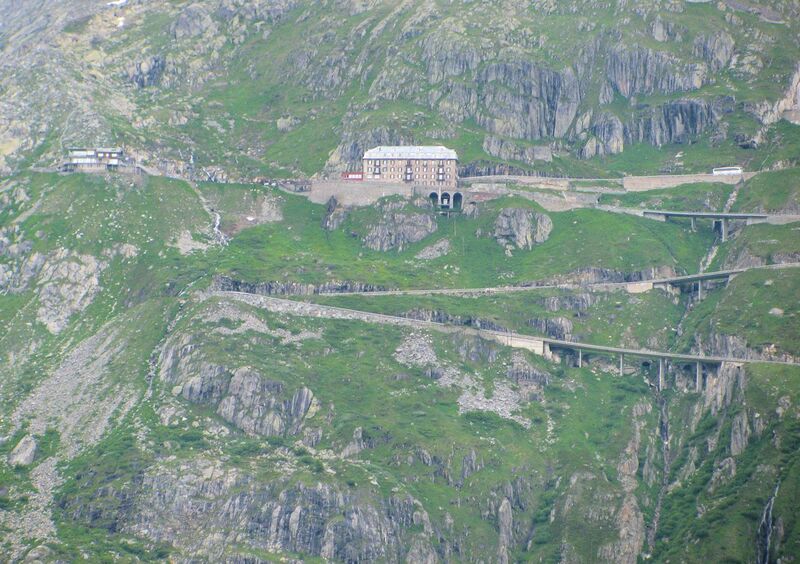 It ends at Gletsch (also at the bottom of Grimsel Pass) after 17.5 miles. 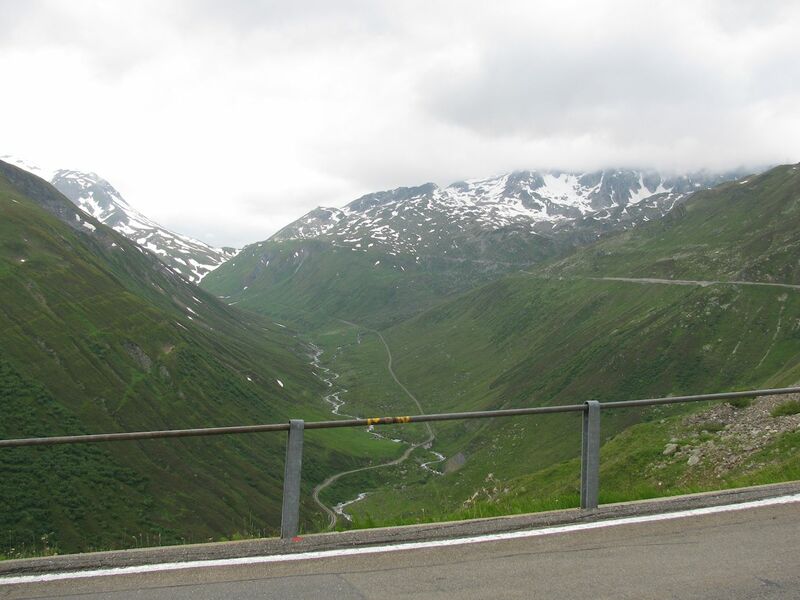 H19 Furkastrasse runs flat for a few miles beside the Furka-Oberalp railway line then, after Realp (below), starts to climb. In the book, Bonds tails Goldfinger across France to Coppet, up the lake from Geneva. 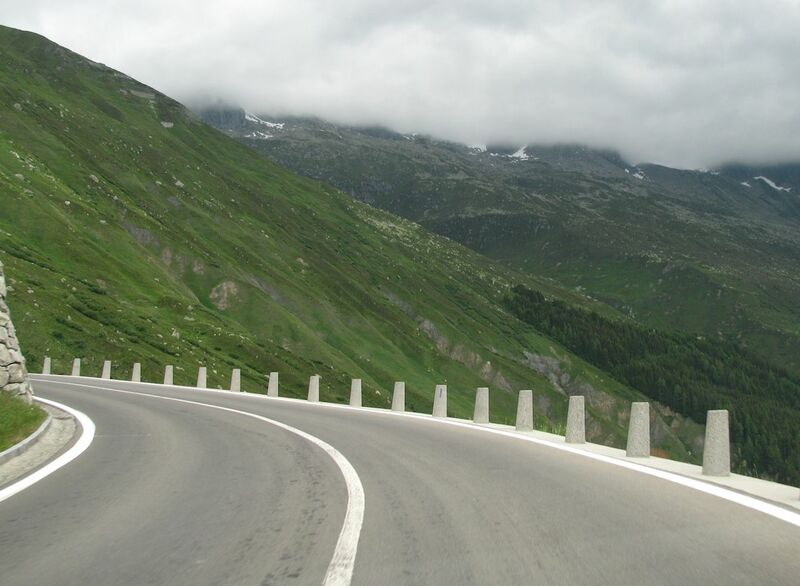 In the film, the action takes place on the Furka Pass. 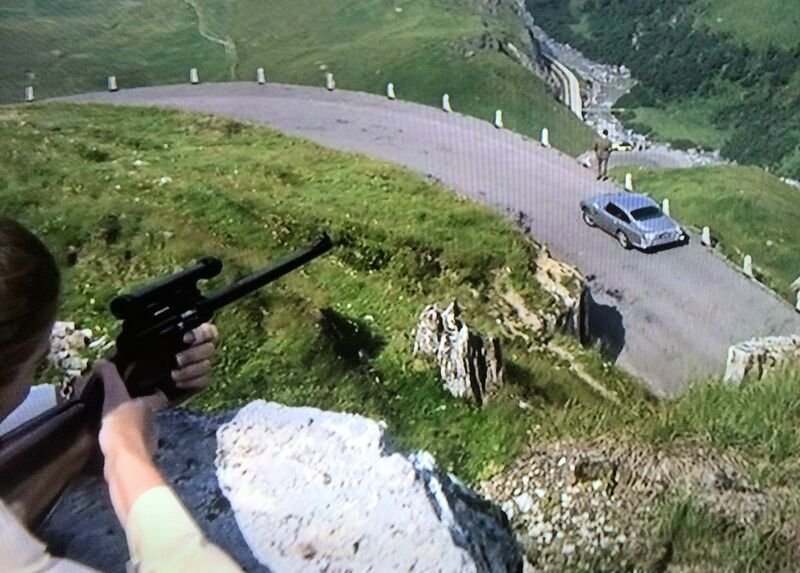 Whatever other liberties it takes with Fleming’s original, the movie’s basic sequence is correct – the first shot of Goldfinger’s Rolls-Royce is heading up the mountain from the Belvedere Hotel on the west ascent (i.e. in the opposite direction to us). Bond and Tilly Masterson follow Goldfinger over the pass until he stops to buy some fruit from a stall on the final hairpin, above the Furkareuss River before Realp. As Bond watches over from higher up the mountain, Masterson, higher still, takes her famous shot, kicking up the dust beside Bond’s feet. Bond later shreds Tilly’s tyres on the H19 back to Hospental, beside the railway line. He drops her off at the Aurora filling station on Gotthardstrasse on the way into Andermatt (now the Aurora Garage and Hotel, and Restaurant Aelpli). The bollards have been replaced recently, and moved closer together, but the essential character of Furka has been retained. Oh yes. Who knows, this might be the very corner where Sean Connery stood looking down on Oddjob and Goldfinger. 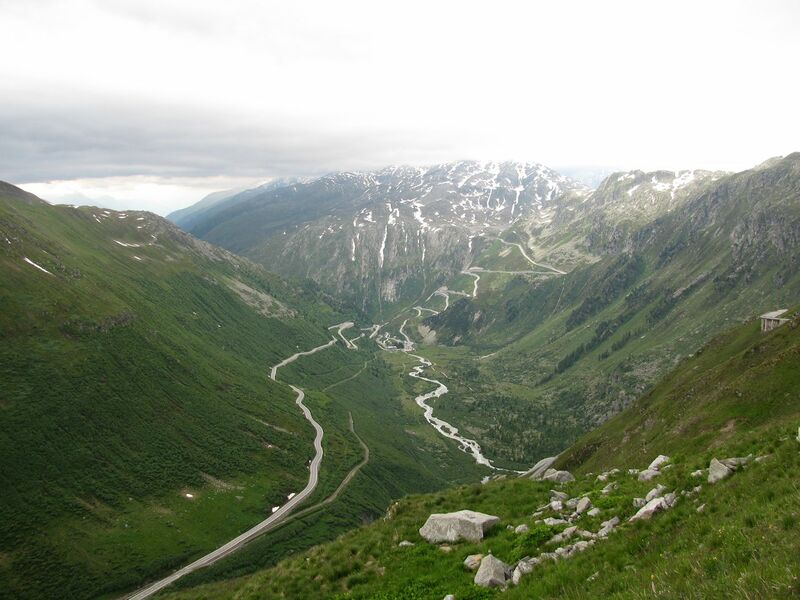 After the 15.4km Furka Base Tunnel opened in 1982 – a car train runs between Disentis via Oberalppass to Andermatt then on to Brig – the original track from 1925, bottom centre, was left redundant. However it reopened in 2010 as a heritage line and now runs between Realp and Oberwald with steam engines. The Furkareuss river draws water from both the Uri Alps in the north and Lepontine Alps in the south. It meets the Gotthardreuss at Hospental to make the Reuss River proper. Not all of the bollards have been spruced up. Not to put too fine a point on it, the road on the east side is, in places, too narrow for two cars to pass at the same time. 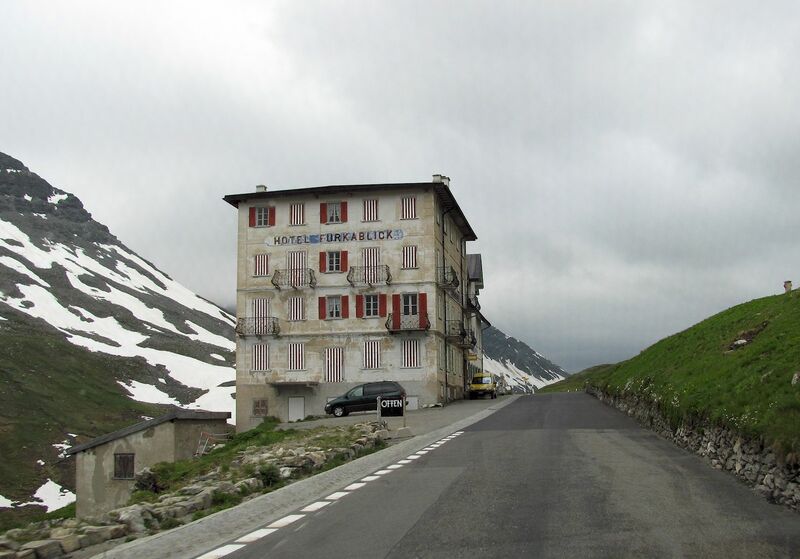 The lesser known of the six hotels on the Furka Pass but potentially the most interesting. Hotel Furkablick was built in 1896 when the road was first constructed for stagecoaches. The rooms have been preserved exactly as was, furniture and all, but the ground floor was made-over by modernist architect Rem Koolhaas. The hotel was taken on by a Neuchatel gallerist in the 1980s and reimagined as an unlikely meeting place for artists, hikers, bikers and drivers. The striped shutters are the characteristic work of French conceptual artist Daniel Buren. Dotted around the mountainsides are discreet, carved ‘truisms’ by Jenny Holzer. The hotel part is now sadly shut but the (concrete and steel) restaurant and bar, as you can see, are still open. It’s no surprise manufacturers, Kia in this case, find Furka a suitable testing course for new vehicles. 2436m, 7992ft. Maximum 11% gradient. Grimsel Pass from Furka. Also down there are the first few splashes of the River Rhone. Poor Mutt. Muttgletscher – Mutt Glacier – barely rates a mention anywhere due to being a mere 1km long. Dwarfed in every sense by its incredible, awe-inpsiring near neighbour. Hat tip to this guy. 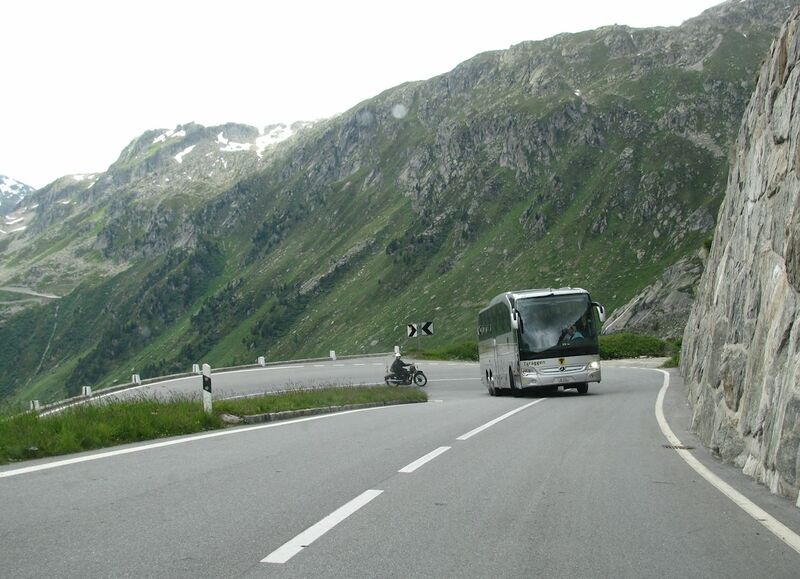 There were plenty of motorhomes at the top so Furka is clearly not restricted for larger vehicles. Still, it was a shock to see a full size coach on the way up bearing in mind how narrow the road is on the other side. It turns out however that the Swiss Postbus network includes trips over all the Central Alps passes. That dirty grey crust centre left is the Rhone Glacier, source of the River Rhone. Early last century it reached down almost into Gletsch but has been in retreat since. It’s still 8km long, starting at the western slope of Dammastock (3630m – the highest peak in the Uri Alps), running down between Galenstock (3586m) and Klein Furkahorn (3026m) in the east, and Garstenhorner (3189m) in the west. Whereas the Furkareuss river flows down into the Rhine, and ultimately to the North Sea, the Rhone heads west to fill Lake Geneva then to the Mediterranean through south east France. 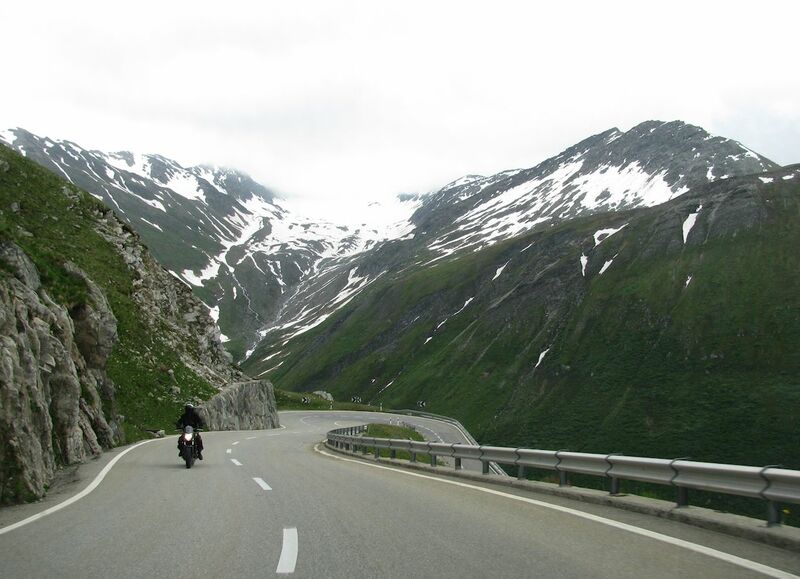 Furka Pass is the sixth road on ‘The Loop’, six mountain passes all centered on Andermatt in south central Switzerland. 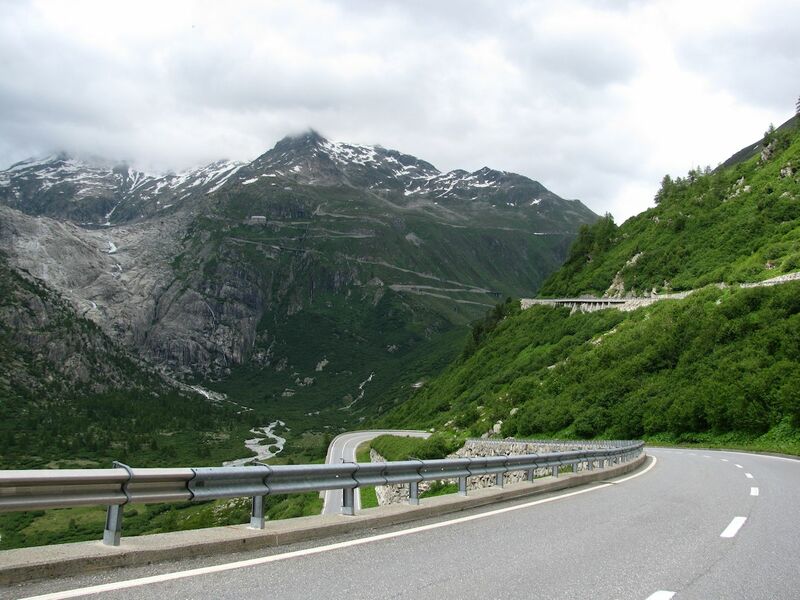 See here for the first two, Gotthard Pass and Tremola, or here for Nufenen Pass, Grimsel Pass and Susten Pass. Nice photos though for those wishing to ‘recreate’ the famous Goldfinger photo of Sean Connery, a geolocated spot on which corner the Aston was parked up on would be useful. 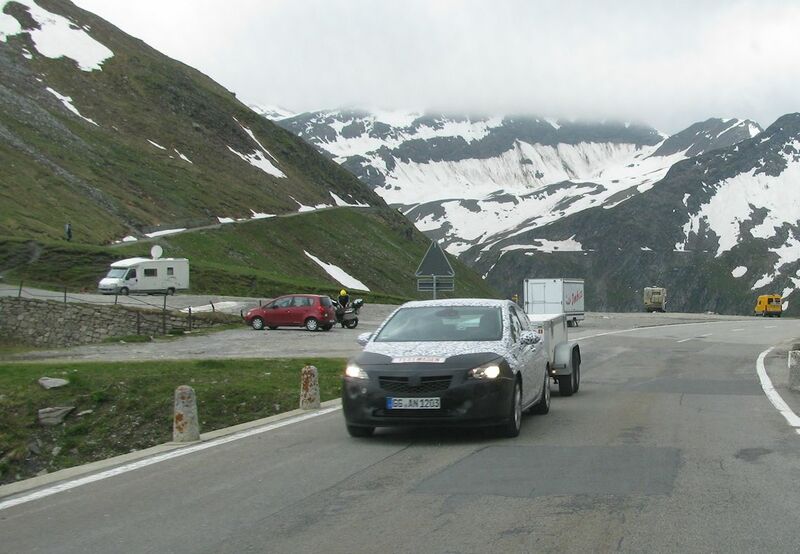 Difficult to be absolutely precise but the scene was filmed on the hairpins on the final ascent from direction Gotthard. Hope this helps ..